Blog | Nathan Holic | this is what happens when a writer says, "I guess I need a web site"
A couple quick updates, from Nathan Holic the artist (as opposed to Nathan Holic the fiction writer, or even Nathan Holic the editor or Nathan Holic the sometimes-blogger)! Last Fall, I had the opportunity to teach a class called The Rhetoric of Comics. It was a blast, and I savored every second of it. I also created a course-specific blog for the class, which is one reason why I haven’t been updating this–my author site/ blog–very often in the last few months. It’s tough to keep so many portals constantly updated. Anyway, though, the class is now over, but the blog still exists. If you’re interested in seeing some of the assignments and the student work from the class, just click here. I’m also excited to announce the publication of author-punker Lavinia Ludlow’s second novel, Single Stroke Seven, which will burst onto the scene in March. Lavinia asked me to draw the cover of the book, which you can see below. To order the book, click here. You can also read some of Lavinia’s writing advice/ lessons here. She references some of our interactions as writer-editor team a few years back, so I get a name-drop or two. And finally, because I was teaching a Rhetoric of Comics course last Fall, I spent a lot of time writing/ drawing comics. (That’s what happens. When I teach a particular genre, I wind up immersing myself in it, and really spending all of my creative time indulging in that genre.) So, in addition to creating the course syllabus and all of the assignment sheets as comics (see two example images below), I also wanted to draw at least one complete original comic. At the end of the Fall semester, I received two different opportunities to do so. The first was an invitation to participate in the ongoing Transit Interpretation Project (TrIP) here in Orlando, which asks local artists to use public transit in the city and then “interpret” the experience. Orlando is, quite simply, not a city known for its incredible public transit, and so many of the pieces of artwork offer commentary on the issues that riders face. My own contribution was a little more light-hearted, but (I think) also speaks to how/why public transit is used in the city (more as a lark than as a reliable method to get somewhere)…my wife and I took a “date day” on the SunRail, and you can read my comic here. Finally, novelist Alex Kudera asked me to contribute a comic adaptation of one chapter of his novel Fight For Your Long Day for a brand-new classroom edition of the book. This was a pretty involved project, and one of the longest comics I’d created in awhile. Below is a single page, and I’ll offer updates when the edition is published. You can read Alex Kudera’s blog for more information. What’s going on this Spring? Well, I’m teaching, and finishing final revisions on a novel I’ve been working on since 2010 or so. And then there’s AWP in Los Angeles at the start of April, where I’ll sit on a panel to talk about my Rhetoric of Comics course. So there are some things coming up for writer-teacher-editor-artist Nathan Holic. Maybe I’ll write another blog update to let you know about them? Maybe…maybe…That might be a productive use of time. It’s been a little while since I’ve posted, and I keep forgetting to post/update, but I figured: today is a good day for a blog post. If you haven’t already seen/read, The Cincinnati Review (and author Don Peteroy) did a great write-up of my new novella, The Things I Don’t See. If you haven’t already picked up a copy of the book, you can order online from Main Street Rag (the publisher), or drop me an email for a signed copy, or (if you’re in Orlando) swing by Bookmark It in East End Market, or trudge to the Barnes & Noble Bookstore on the University of Central Florida campus. As we creep closer to the release date for The Things I Don’t See, my new novella, it’s exciting to see that other people are, like, actually talking about the book. The first is the Orlando Weekly, our alternative newspaper here in town. They’ve been incredibly supportive of the work I’ve done with Burrow Press, and of my first novel (American Fraternity Man), and it was exciting to see The Things I Don’t See mentioned in an article today about books they’re looking forward to in 2015. And also pretty cool: there’s this, from the blog of bestselling author Jeff Vandermeer, who recently visited Orlando. He talks with Ryan Rivas at Burrow Press (with whom I’ve spent a lot of time and energy in constructing the “15 Views” series), and says some great things about the Orlando literary community. Ryan’s such a smart, caring, and hard-working editor and publisher…it’s awesome to see him getting the regional and national attention that he deserves for his efforts. That’s all for today. 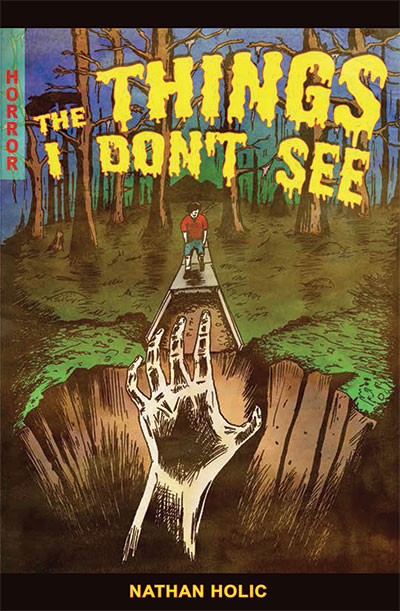 Happy holidays to all of my loyal blog followers, and–if you’re looking for a way to spend that extra $6 in your paycheck–remember to hit up the Things I Don’t See pre-sale, which concludes very soon! The Things I Don’t See – Pre-Sale! Here is the posting I’ve been looking forward to sharing! My new novella, The Things I Don’t See, has an official page on the Main Street Rag Publishing Company’s online bookstore, and an official release date. In fact, you can even order it right now. It would actually be my suggestion (gentle, but still enthusiastic) to follow this link and place your order during the limited-time-only pre-sale event. I honestly don’t know how long the pre-sale lasts, and while I realize that this is an over-clever infomercial type of expression (“Act now!” etc. ), I can seriously tell you that–should you have even the remotest interest in ordering, and/or reading, and/or just sort of touching the book–you’ll want to order while the price is $6.00. Below is the cover to my novella, and I think it looks pretty spectacular. A million thanks to Lesley Silvia for the gorgeous colors, and for turning a sketch of mine into a full-color replica of an old 1950s EC comic cover. A week or so ago, I posted my entry in the “My Writing Process” blog tour. I tagged three writers, John King, Mark Pursell, and Teege Braune, who continued the tour. For your easy reading pleasure, I have compiled the links to their blog posts here. Enjoy!